Voters in eastern Chittenden County will send a signal on Election Day about Vermonters' willingness to consolidate education systems with the aim of lowering property taxes and perhaps improving learning outcomes. 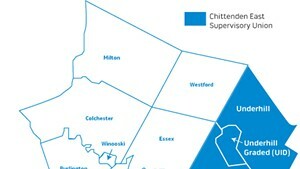 That idea appears to have broad support among residents of the majority of the five towns — Bolton, Huntington, Jericho, Richmond and Underhill — that make up the Chittenden East Supervisory Union. But the complexity of the proposed transition to simpler school governance could prompt confusion as well as skepticism in the voting booth. A similar plan was defeated in a special election in June 2011. The vote on November 4 is the only one of its kind on the ballot this fall in Vermont. Across the state, parents, teachers, union organizers and politicians will be paying very close attention to the result. A change in legislation now allows for the creation of a "modified union district" — considered a significant step toward consolidation. Escalating unhappiness about increases in the education property tax could contribute decisively to a positive outcome this time. Should voters agree to streamline school governance, a state law promises to reduce their property taxes in each of the next four years. The first-year savings per $100,000 of a home's assessed value would range from $86 in Bolton to $24 in Underhill, with homeowners in most of the other towns receiving relief valued at around $75, based on tax rates currently in effect. But proponents aren't selling the plan on the basis of tax savings. "That's a factor, but that's not what's compelling it," says Michael Marks, chairman of a study committee representing all five towns that recommended — 14 to one — that the plan should be adopted. One of its members, Diane Kirson-Glitman of Jericho, agrees that discontent with the property tax is acute, but not to the point where it alone will determine the outcome of next week's vote. In regard to the school tax, Kirson-Glitman assures, "Jericho is not in riot mode." "Concern about students' education is what's really driving" the move to consolidate school governance, according to Marks. The smallest elementary schools in the supervisory union "have had to cut into the bone" in order to balance their budgets, notes Marks, a lawyer who specializes in mediating disputes. As a result, he warns, "we're approaching a tipping point" in the quality of education in those schools. The question on the November 4 ballot doesn't actually pose the possibility of closing or merging schools. Rather, it seeks to streamline the decision-making apparatus for the supervisory union's six elementary schools, two middle schools and one high school. At present, voters in each of the elementary school districts elect five members to local boards. The 30 board members oversee the education of students through fourth grade. Voters also elect 15 members of the Mount Mansfield Union School District board, which governs the schools that enroll students from fifth through 12th grades. There's also a 21-member supervisory union board consisting of three representatives from each of the districts. The item on next week's ballot would effectively reduce from 66 to 15 the number of board members in a part of the county with 2,631 students. That's about 150 fewer students than were attending schools in Chittenden East five years ago. If voters in each of the towns agree, the boards of the six elementary schools would be dissolved, as would the supervisory union board. Their responsibilities would pass to a new 15-person entity, to be known as the Mount Mansfield Unified Union School District Board, which would have control over all public education in Chittenden East from pre-K to 12th grade. Voters in the five towns would elect the members of the new board, with representation apportioned by population. For example, Bolton, with about 1,200 residents, would choose one board member, while Jericho and Richmond — each with a population of about 4,000 — would get four each to represent them. Supporters point to the two middle schools and the high school, which merged their respective boards 50 years ago. The study committee's report asserts that Chittenden East students in grades five-12 enjoy access to quality education. But the same report observes that while the existing supervisory union operates successful schools, it maintains "a fragmented educational governance structure that affects our ability to serve students and taxpayers, and makes no sense for a community of neighbors that has a long and successful history of working together." In other words, things could be better. In addition to ensuring property tax reductions, the proposed consolidation plan would generate an estimated $323,000 in savings through enhanced administrative efficiency, according to the report. Consolidating boards would also enable discussions to take place regarding possibly closing one or more schools, supporters of the plan say. They caution, however, that nothing along those lines has yet been envisioned or proposed. Without a change in governance — such as this measure would bring about — it's not possible to discuss school mergers. And if residents say yes next week, state law still mandates no merger could occur for at least four years, unless a town voluntarily agrees to shut down its school. Bob Low, a former school board member from Richmond who teaches in the College of Medicine at the University of Vermont, says the report fails to persuade him that the consolidation plan will improve education. He and his wife, Liz Low, a retired UVM professor and former school board member, both also express doubt that the predicted $323,000 in administrative cost savings will actually materialize. The plan does not factor in cost increases that will likely ensue under the consolidated board structure, they say. Megs Keir, the one-woman minority on the merger committee, shares those misgivings, and suggests that the property tax savings isn't all that it seems. The percentage of rate reductions diminishes in each of four years they are in effect, dropping from eight cents per $100 of assessed value, to six, to four, to two cents. And Keir contends the reductions amount to a "handout" that would be subsidized by other state revenues. The property tax cuts that would be enjoyed for a time in the Chittenden East towns "don't do anything to fix what's a statewide problem," she argues. Tuesday's referendum in Chittenden East is the first in Vermont since lawmakers changed state statute to facilitate voluntary consolidation. Prior to 2011, it was an all-or-nothing deal: Unless every town approved it, the proposal would die. A narrow majority of Chittenden East voters three years ago did approve the plan, but it lost in both Richmond and Huntington, with the latter town voting overwhelmingly against it. That law has since been amended to say that if a majority of towns votes for collective governance, they can form a "modified union district," while the boards of the naysaying schools would remain in operation. If three or more towns vote no, the proposal fails altogether. A modified union would prove "divisive," Liz Low says. And she notes that such an arrangement — with one or two towns opting out of a consolidated school board structure — has never been put in place in Vermont. "The committee should have spent more time trying to get to a unified system," she suggests. Huntington is expected to reject board consolidation again on November 4, but this time that won't stop the other school boards from combining forces, merger committee chairman Marks points out. 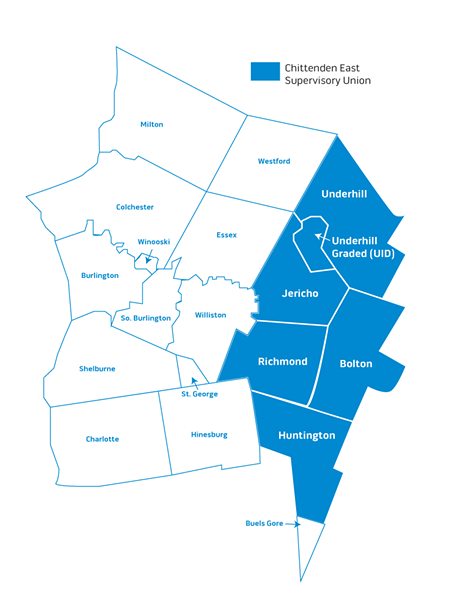 And a "modified union" would not produce significant problems, adds Rep. George Till (D-Jericho), whose district includes Underhill. "Huntington isn't going to be wagging the dog," he predicts. Rather than weakening local control over elementary schools, voting yes on this proposal would keep it intact, says Till. As a supporter of the ballot item, he argues that inclusion of the "modified union" option is essential to making any progress toward consolidation. He offers the scenario of the new Mount Mansfield Union School District eventually deciding to add grade five and possibly six to one or more of the elementary schools, which would permit the closing of one of the two middle schools, both of which, according to Till, are operating at half their capacity. Till predicts that any town opting out of the plan will likely come to see its virtues and eventually decide to join the majority.